Have I got a honey of a festival for you to enjoy. It involves making a beeline for Beeton to celebrate the Bee Town's annual salute to the golden nectar. Trivia question for the day. Have you even wondered where the names for Georgian Bay's Palestine and Cyprus Islands came from; or what Honey Harbour was named after? The answer involves a man by the name of David Allanson Jones. Jones was a storekeeper and postmaster who settled in the small West Gwillimbury community of Clarksville during the 1860's. By 1870 he owned fifty acres of farmland and two swarms of bees. From these simple beginnings, Jones became the first commercial beekeeper in Canada. Across Europe and North America, David A. Jones was known as the Bee King of the Nineteenth Century. In 1875, Clarksville was renamed Bee Town in his honour. Eventually the spelling was changed to the short British form, Beeton. Jones pursued beekeeping as an industry, not a sideline. To prove his point, he took two box cars of honey to the first Industrial Exhibition in Toronto in 1880. That amounted to 70,000 pounds of honey from 400 hives. At the time, most beekeepers brought a dozen jars and hoped to sell them by the end of the day. A master merchandiser, Jones sold most of his product for better than going rate. To answer the trivia question, Jones was the first to import bees into Ontario. Breeding stock came from Cyprus, Palestine, the Holy Land and Borneo. The imported bees had to be isolated for a period of time. Islands in Georgian Bay off Parry Sound were the location of choice. While traveling, Jones learned that bees which fed on clover produced the purest honey. To feed his bees, he scattered wild white clover seed along railroad rights-of-way. Early farmers cursed this new weed whose seeds spread rapidly. Now it is grown extensively as a soil fertilizer. 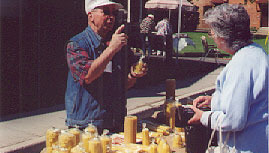 Jones exhibited his honey throughout North America and Europe. While at the Crystal Palace in London, England, he persuaded the sons of British and Scottish gentry to come to Beeton to learn the beekeeping trade. A large number accepted his invitation and several married local girls. Who then, but the town of Beeton, nestled in the rolling hills of modern day New Tecumseh in Simcoe County, should salute honey. Yearly, Beeton Honey Festival & Garden Show strives to present great family entertainment. Held on the last Saturday in May each year, the event is done up in grand style. Main Street is closed to allow vendors to sell in-theme wares. 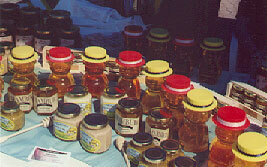 Visitors find honey vendors selling their sweet product along with beeswax candles, flowers and gardening supplies, in-theme crafts and other speciality items. Main Street is also the location for various beekeeping displays, including an excellent permanent beekeeping exhibit at the Olde Bee-Town Museum. We usually start the day with a hearty Pancake & Sausage breakfast at Jackson Place. 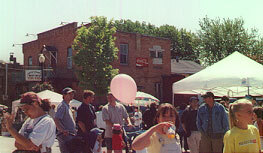 The retail square, right on Main Street, is also the site for musical entertainment and children's activities. During breakfast, classic cars and trucks begin to arrive for their special show on Main Street. One of the fun things to do is to choose a favourite vehicle from those that attend. Many try to lure your vote by decorating their vehicles creatively with bee-related items. The annual Soap Box Derby gets underway at 9:30 a.m. at the opposite end of the street to the Car Show. This Derby has a little twist. There's no hill on Main Street so lots of action takes place as participants try to steer, while their vehicles are being pushed down the level course. If you're itching to get involved, build and enter your own soap box. Information is available through the Festival office. The same section of street becomes a Bicycle Obstacle Course during the afternoon. Children have loads of fun while learning rules of the road and no-one leaves without an award of some sort. As flowers play an important part in honey making, what can be more natural than to hold the Annual Flower Show on the same day. Everyone's encouraged to visit the many creative displays in a building next to the library. You can vote for your favorite flower display. Speaking of the library, their annual book sale is held on Honey Festival day. This sale is a bonanza for book-a-holics who know that there's plenty of good winter reading left in old books. You can buy books cheap-singularly, by the bag and by the box. Go early for best selection. 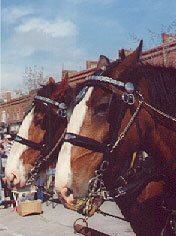 When your feet get sore hop aboard the Victorian wagon that is pulled by two heavy work horses, for a ride around the pretty community. Tree-lined Centre Street in particular has some lovely examples of late Victorian and early 20th century architecture. Keep in mind that Centre Street was once a large gully that Mr. Jones had filled in with gravel to make a grand thoroughfare. He wanted to make a street that would be suitable for those sons of British gentry to built grand homes, had they wished to stay. Main Street has some great late Victorian commercial architecture. The structures you see today are second generation buildings. Beeton's Main Street was largely destroyed by fire in 1892. Most buildings are of red clay brick, a hallmark building material in Simcoe County. Other famous people can claim Beeton as home. Gordon Tamblyn, a druggist whose chain of Toronto stores became known as I.D.A. Drug Stores, was a hometown boy. Hockey players Wayne Carleton, John Gould, Bob Pulford and Jim Rutherford are area boys. Who remembers Kate Aitken, Canada's early twentieth century answer to Martha Stewart. Kate was a Canadian radio and television personality, and newspaper columnist. For more than fifty years, her timely and homey advice was heard and heeded by thousands of Canadian women. Kate was born on the east corner of Centre and Main Streets. Rumour has it that her childhood home and family store are going to be restored. Various church groups offer reasonably-priced sandwiches, home-made pie and refreshments on Main Street during the Honey Festival. If you compliment them on their pie, one of the ladies will invariably say "You know, that's one of Kate's recipes". There's nothing pretentious about Beeton's Honey and Garden Festival. Organizers don't advertise that they are the biggest, the best or the only event of its kind, even though they have a perfect right to do so. On the last Saturday in the month of May each year, the tiny high country community honours one of the oldest agricultural practices in the world by holding a great family-oriented street festival. What better place for this event than in the heart of some of the best agricultural land in Ontario, in a pretty town whose name is synonymous with honey.